The X-4 Tool TD-1500 and TD-2000 Torque Multipliers feature 1” square input drives and 1-1/2” square output drives. The TD-1500 provides up to 4000 ft-lbs of output torque at a multiplication factor of 4.33 to 1, the TD-2000 up to 8000 ft-lbs of output torque at a multiplication factor of 4.6 to 1. The X-4 Tool TD-1200 two-stage Torque Multiplier features a ¾’ square input drive and a 1-1/2” square output drive and provides up to 3000 ft-lbs of output torque at a multiplication factor of 14.3 to 1. 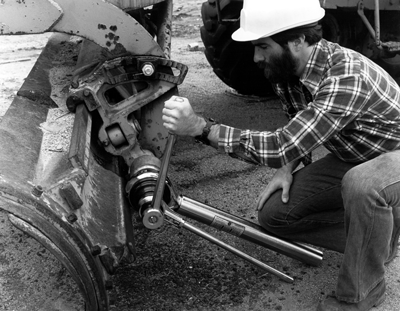 Using the X-4 Tool TD-1200, TD-1500 and TD-2000 Torque Multipliers is quick and easy. Simply attach any appropriately-sized standard drive socket to the 1-1/2” output drive square of the torque multiplier. Then, Insert the drive end of a ratchet, breaker bar, torque wrench or other standard drive tool into the input square of the multiplier. (Please note that impact type driving tools SHOULD NOT be used.) Place the torque multiplier assembly on the fastener with the reaction bar securely restrained against a fixed object or surface. Any force applied to the drive tool is multiplied at the output end of the X-4 Tool Torque Multiplier at a factor dependent upon the model being used. For higher ratios of multiplication, two or more torque multipliers may be directly coupled.